Know of someone who can’t or will not decide whether they have a sweet or savoury tooth? This gluten-free gift selection is especially for them. The Sweet and Savoury gift box selection is an indulgent balance of sweet and savoury favourites including light snacks, inspirational meal ideas and tasty bakes. 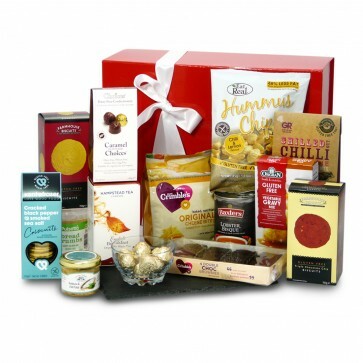 The gluten free food and drink in the Sweet and Savoury Gluten Free Selection is carefully packed by hand in a gorgeous gift box. If substitutions are required, you will receive items that are the same (or higher) value and that will compliment your original selection.